Extrusion is quite like squeezing toothpaste out of a tube. Anything that is long with a consistent cross section is probably made by extrusion. Common examples are optical fibers, candy canes, plumbing pipes, chewing gums, drinking straws, door insulation seals, steel or aluminum I-beams, and spaghetti. 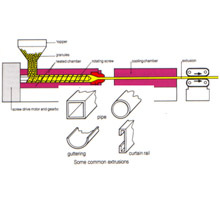 The plastic extrusion molding process typically begins with a thermoplastic in the form of pellets or granules. These are usually stored in a funnel-shaped receptacle called a “hopper” before being moved to a heated barrel. After melting the plastic is forced through an orifice, usually a custom steel die shaped like the cross-section of the intended part, forming a tube-like or rod-like continuous workpiece. Cooling of this workpiece should occur as evenly as possible.